Cuan Law is the largest sailing trimaran in the world, and she's not like any other liveaboard dive boat you've encountered. Custom designed for luxury liveaboard diving and sailing by owner/designer Duncan Muirhead in 1988, and refit and redecorated on annual basis, Cuan Law spans 105 feet in length and 44 feet in width. 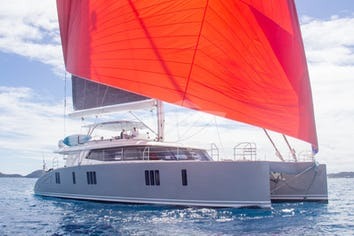 Two 103' masts spread 5,200 square feet of sail over the massive deck. 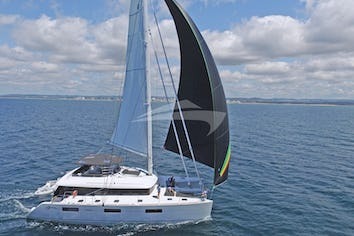 Her size and the triple hull design provide extreme stability, both at anchor and while underway. The Cuan Law crew will make you feel right at home the minute you step foot onboard. 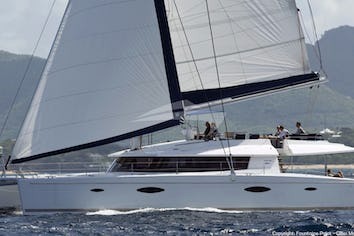 CUAN LAW can accommodate 20 guests in 10 cabins. Each of the 10 guest cabins have a queen size bed, or 2 single beds, shower and toilet. CUAN LAW is fully air conditioned through out. Included with your Cuan Law package are tanks (aluminum 63s, 80s and 100s), weights, belts, masks, fins, snorkels & air. Cuan Law offers high quality rental dive equipment onboard including regulators and BCs. Captain Scott over many years has done everything and every job on the Cuan Law except Chef. We owe him a huge dept of gratitude as he has been the foundation stone of the crew. He has trained up dozens of our crew over the years. Scott started off as steward on board and then, after getting his Divemaster rating, he led many dives in addition to his work as steward. Scott still loves to dive and will certainly do some dives with you whilst on board. He then moved on to Engineer as he had always had a great interest in, and aptitude for, the ship's machinery and equipment. He has fixed numerous problems, installed much new equipment and machinery and done many upgrades. He still likes to mess around below decks playing with machines! After a few years as Engineer and then First Mate, we promoted him to Captain and added the job later of Captain Trainer. Scott has done many, many charters as Captain, has as much knowledge as Owner Duncan, and really understands "The Cuan Law Way". He has a great sense of humor and is very fun-loving, and he runs a well organized and motivated team. A few years ago he married our then Chef, Kellie, whom many of our past guests will remember and future guests will get to meet as she is now back on board. Scott’s sister, Kim, is our Operations Manager. Ariel was born and raised on Tortola and moved to Thailand at the age of 12. Ariel joined us on board the Cuan Law shortly after he returned to the BVI’s in 2017 as steward and is currently very excited as he has decided to embark on training to become our engineer. Already - in just his first year year spent with us on the Cuan Law - Ariel has become a Certified diver and is working on getting his Dive Master. He’s also gained experience with cooking which occasionally helps remind him of his years in Thailand as he still spends some of his time in the galley. In his free time he enjoys skateboarding, surfing and being out on the water with friends. With his deep love for music he also owns a guitar that, unsurprisingly he doesn’t have time to play!